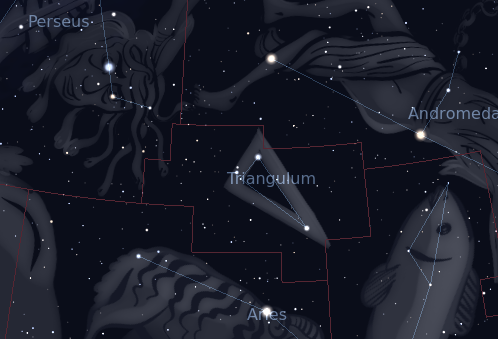 The constellation Triangulum. Roll mouse over to see labels. Triangulum is a small yet ancient northern constellation, nestling between Andromeda and Aries. It appears highest in the evening sky in the months around October. Comprising simply of a triangle of two third magnitude stars and one fourth magnitude star, it is far from conspicuous. In ancient Greece it was known as ‘Deltoton’ because it resembled a capital delta (Δ). 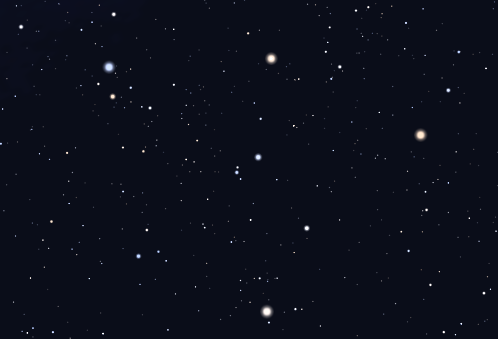 Although it is home to only one bright deep sky object, it is a significant one. The Triangulum Galaxy (M33) is a member of the Local Group of galaxies, and the second-closest galaxy of comparable size to our own. M33 is a spiral galaxy like our own, and orientated in an almost face-on orientation so that its spiral structure is finely displayed. However, this also means its light is spread over a large sky area, comparable in size to the full moon. The slightest light pollution makes it quite impossible to make out its diffuse light. Triangulum contains the following Messier object: M33. The following constellations neighbor Triangulum: Andromeda, Aries, Perseus, Pisces.